What are your favorite Commonwealth of Virginia attractions? I bet you'll find some of them here in the upper Northern Neck and Colonial Beach region. There are plenty to choose from, whether you're interested in History, Nature, Sports or Recreation. Plan a trip soon, you're bound to have a good time here in "the 'neck." For quick reference, the specific places to visit are grouped by theme, with a "More" category for all the other interesting sights to see. If you're seeking an attraction not listed here, please see the Events page, or the Sitemap. This is probably one of the most popular Colonial Beach, Virginia Attractions. Stroll along the beautiful Boardwalk in Colonial Beach and take in the sights and sounds of the beach area, like the newly painted mural. The proposed teen Gaming Lounge/Beach Clubhouse was to have opened on the boardwalk. Currently it is a police substation for special events. Be sure to continue onto the Riverwalk once you reach the end of the boardwalk. Over twenty area eateries, with more being added all the time, there's an eating establishment to serve up whatever you're craving. 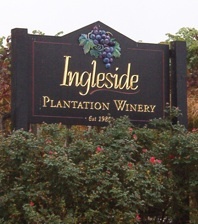 One of the largest in Virginia attractions like this wonderful winery are a must-see for your visit to the area. This could also fall under the "nature" category due to their cool "goat walk" feature. Pick your own or buy pre-picked fruits and berries. Try one of their sundaes! Blink and you'll miss it, this site is just down Route 301. There's a tour you can take that retraces the escape route of President Lincoln's assassin. Featuring a handful of markers and monuments, there's also a top-notch Visitor Center here where you can learn more about the 5th President of the United States. A working farm exists at the site of the first President's birth. My favorite part is the outline of the foundation of the house he was born in. A gorgeous waterfront structure on the National Register of Historic Places, this home is currently a Bed & Breakfast Inn. One of my favorite Virginia attractions, this stunning Pusey & Jones creation returned here from D.C.'s Gangplank Marina in the Spring of 2013. The site of gatherings every Memorial Day and Veterans Day, this monument pays tribute to those who served. Stratford Hall, home of the Lees is one of the more impressive Virginia attractions. You'll find it just down Route 3 a bit, near Montross. 483 Great House Road, Stratford, VA 22558. 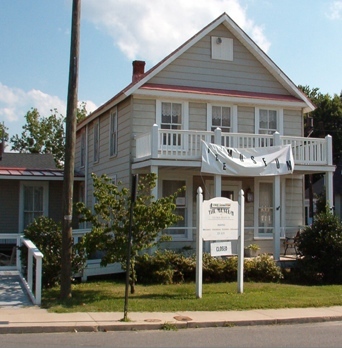 The craft that inspired the novel, and later the stage production and films, "Show Boat" is planned for rebuild, to once again bring live performances to the waters in Colonial Beach. This area is adjacent to the Westmoreland Berry Farm and offers scenic views of the Rappahannock River, trails for hiking and more. A beautiful riverfront state park with high cliffs that offer tremendous views. Camping, fishing, hiking, swimming, kayaking are some of the activities available. You can hunt for fossils here too. Plenty of places to park the RV, pitch the tent and enjoy some well-deserved R&R. There are over 425 species of birds in Virginia. Lots of them can be found (especially bald eagles!) in Colonial Beach and the Northern Neck. Watch cars, trucks, motorcycles and ATV's race here. Just about anything with wheels. (temporarily closed) Load up the family and the dirtbikes and ATV's, and enjoy a fun day of riding. Woods trails as well as a motocross track. Special events like mud bogs and drag racing take place here too. 1954 Ford Museum The only thing in this museum are 1954 Fords, every model that was produced that year. Northern Neck Rivermen semi-pro football. A relatively new team, the Rivermen consistently earn top honors. You can see them play home games at a local High School in their summer league. Pump some iron at River Gym. 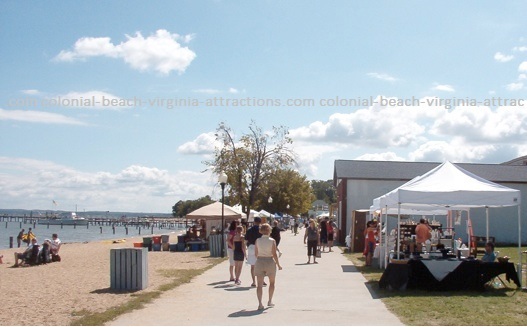 Lots of places to park the boat and enjoy a visit to the Northern Neck and Colonial Beach. Many area piers to choose from for a great day of fishing. Board "The Big Dipper" for a fishing trip up and down the Potomac River. The "Reel-Em-N" at Monroe Bay Campground offers bottom fishing, trolling aboard the 22-ft "Flying Frog" with license, equipment, bait and a mate provided. Capt. Foster can be reached at 703-971-1669, 703-966-3363 or 571-329-8109. Kayaking on the Potomac and other area waters is a great way to spend the day. An award-winning public facility in a spectacular location. 18 holes, regulation-length. Hone your skills at their wooded course and open target practice field. On-site store, snack bar and trophy room. The library features many regular events. There's always something going on. Adopt a cat (or two) from Wendy. Antiques, gifts, clothing and more! Whatever you're shopping for, you can probably find it here. 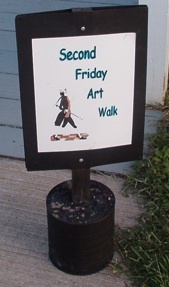 Attractions include a number of galleries and a Second Friday Art Walk. Paint your own Pottery or take a class, or hold a group pottery painting party. Take a dip in a Swimming Pool for a refreshing way to beat the summer heat. Try your luck at finding an ancient Shark's Tooth or two. Many fun parks and playgrounds like Castlewood Park and Eleanor Park are in the area. Perfect your craft, whether it be music, painting, pottery, language, crafts or cooking with an art lesson. Check out the musical stylings of our many talented local bands and musicians. Come and see the biggest stars in a celebrity impersonator extraordinaire show.